Recently I was on a conference call discussing the new leadership style of Generation X. The keynote’s title was “Bridging the Generation Gap – Passing the Torch!”. The leaders on the call shared with me that their leadership team, of mostly Baby Boomers, were all close to retirement. It was time for Generation X to take over the leadership reigns. The Boomers were worried–and the X’ers were excited! Gen X leaders have a style that is very different from the Boomers. To get a better understanding of the psyche of Gen X leaders let’s go back and discover what makes them tick. As with most generational labels, “Generation X” is a somewhat negative term. It was coined by Douglas Coupland, author of the 1991 book Generation X: Tales for an Accelerated Culture. For Coupland the letter “X” was meant to signify the generation’s random, ambiguous, and contradictory ways. Generation Xers were the children born during a time of shifting social and family values, a challenging economy, and advances in technology in the U.S. Boomers, who were also called the “Me Generation”, were deep into self-actualizing. Their focus seemed to be less on their children and more on themselves and their careers. Gen X kids grew up in harder times than the Boomers. Between 1979 and 1995, some 43 million jobs were lost through corporate downsizing. Newly created jobs paid less and offered fewer benefits and stagflation appeared. In economics stagflation happens when the inflation rate is high, the economic growth rate slows, and unemployment remains steadily high. Many families needed more than one income to survive and women reentered the workforce to provide the extra revenue. The challenges in the American economy combined with other social changes, including “the pill”, feminism, increased levels of education among women and men, revolutionized the American family. A new trend was occurring. American couples began to marry later, have fewer children, and divorce more frequently. In 1973, when “the pill” went on the market, most Americans lived in traditional nuclear-style families. The average married couple had three to four children, and mothers stayed home tending to the family. By 2000, the average family had shrunk to two children (that’s why this generation is so small), and one out of two marriages was ending in divorce. Almost a third of American children were being raised by a single parent or an unmarried couple—further contributing to profound changes in family dynamics. Kids had lots of freedom back in the 70s and 80s. They played outside! 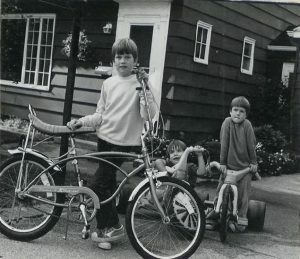 They had wheels (their bikes) and they got to roam and ride all day until the streetlights came on at night. More than likely, this childhood freedom will never happen again. Helicopter parents have entered the building! The term “Latchkey Kids,” a name created by Boomers, referred to children who came home from school to an empty house because mom was working. The kids of this era were given a great deal of responsibility and a list of chores was often left on the kitchen table to be completed before mom got home. Empty the dishwasher, plug in the crock pot, do your homework, and help your brother and sister with theirs, fill the ice cube trays, set the table, and don’t make a mess. The responsible Xer did get many of the items on the list done, but only after hours of watching MTV, listening to the radio, and making mixed-tapes to share with their friends. Now let’s pause for a moment. If you were born between 1964 and 1979, your mom did not work, and you did not have lots of independence you may be more like a Boomer than a Gen Xer. The same goes for Boomers. No matter what your age if your mom worked and you were left alone to be independent and more personally responsible you may relate more to Gen X.
Let’s go back to the growing-up years of Gen X leaders and reflect on them. Parents and even teachers did not coddle this generation along with the Boomers. Gen X saw first hand that their parents were human and fallible. They often found themselves giving their parents advice and comfort. Autonomy and self-reliance, rather than respect for authority were natural byproducts of the Generation X childhood. Looking back at this generation, it’s easy to see that Gen X could possibly be the last generation of children and teens to grow up with freedom, independence, and the luxury to try different things on their own, fail, and try again. Generation X entered the workforce when the Boomers were in their prime. Early on there were not many areas for this generation to flourish—except, of course, in technology! Gen X is your bread and butter. They have worked through more recessions than their parents or grandparents ever did. Most often they are executive leaders who are on the cusp of becoming the C-class, but aren’t thriving in the workplace. The closer these workers get to 55 the more their knowledge becomes invaluable to your organization and to your customers. They are your intellectual capital. Because many Gen X leaders had early contact with the “real world,” they are highly self-reliant and positioned to take on leadership in all organizations—corporate, non-profit, and community. As a whole they are serious about meeting commitments. They have a strong sense of purpose and are highly resilient. Gen X is the generation who wants options/choices. They don’t want to be cornered into just one single way of doing something. They are innovative, creative, and insightful. These qualities position them for great leadership in an era of disruptive thinking. Gen X values new ideas and “out of the box” thinking. As leaders today, they must help organizations become more collaborative. They must continue to ask great questions and get others excited and engaged in work and projects. They must embrace complexity and continue to seek new answers and new disruptions. And they must keep up their need for authenticity, purpose, and mission in the workplace and world. Subscribe to Karen's newsletter to get all her latest insights, tips, and Lessons From the Road!